Email signatures can have an outstanding promotional value. This offers a great opportunity, especially for marketing experts. If you need a ready-to-go template or inspiration for a marketing email signature, you have come to the right place. Here are some good practice tips for those who want to use every opportunity to promote their company and products. Download this example, for other templates available free of charge, follow this link or use this free email signature generator to create your own signature templates. There are plenty ideas for a good email signature for a marketer. Why is this one well designed? Many marketers have experienced themselves that extensive marketing can have more drawbacks than advantages. People receive so much spam every day, that sometimes even at the slightest suggestion that an email is sent in bulk, they get angry and delete it right away, without giving it a second thought. Keeping it simple guarantees that you do not overdo it. Despite the simplicity of the design, the signature is eye-catching. This is owing to the fact that lively yet matching colors are used. The stripes highlight the most important data and make it easy for the recipients to find the contact info when scanning through emails. What is more, social icons flash with well-known, easily associated colors, giving the viewers a familiar element when they open the message. Notice that in the signature, there is a variety of colors and yet, the signature is cohesive. That is because if you look closely, the signature consists of two colors (apart from the universal black and white) in various shades. Remember it is a good idea to experiment with colors. Especially when you find a good combination and want to add some secret sauce to your marketing email signature. Nowadays, social media are one of the most valuable channels for acquiring new clients. 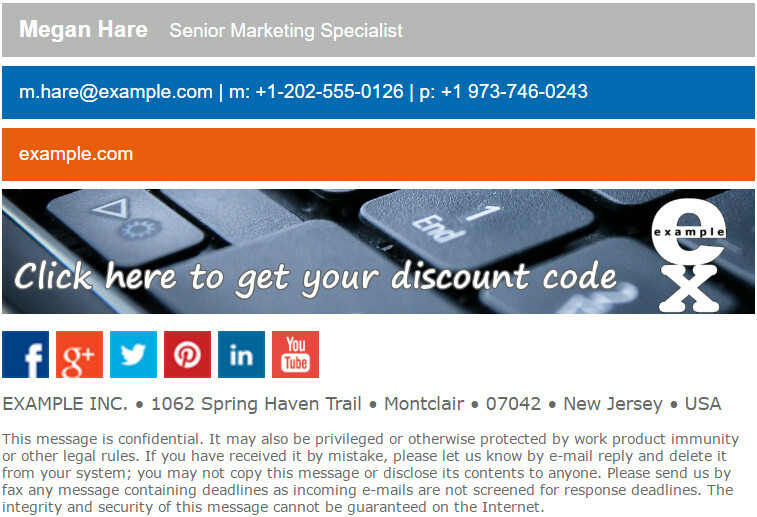 A good marketing email signature needs icons with links to Facebook and Twitter, at the very least. This collection of easily associated logotypes, especially connected with well deployed newsletter, can provide a great social media popularity boost. What is more, they are all in the same place. Thanks to that, people can find all your social media channels easily and quickly. Colors are just properties of the stripes in HTML code. Thanks to that, there is no way email clients will block them and display them as red crosses. The length of stripes is easily modifiable – they can be set to fit to the screen, the text inside, or other elements. You can add more stripes without disturbing the harmony of the signature. This includes all kinds of banners as they have the structure of a stripe. When it comes to managing signatures in an organization, one of the best solutions is to unify signatures for all departments. At the same time, you should remember about customizing email signatures for those who want to have additional elements. While setting a signature for one person is easy, it becomes a bit more complicated when you want to unify signatures throughout an organization. The easiest and most effective way to do that is applying central email signature management. If you want to make this task an easy one, try using third party tools, like CodeTwo Email Signatures for Office 365. The software enables you to easily project and set multiple email signatures for all users in your company, automatically. This entry was posted in Design, Tips and tagged business email signature, email signature guidelines on January 17, 2017 by Adam the 32-bit Aardvark.